It is possible that the SF Symphony has played as well as it did on April 9, 2016, on other occasions, but how could they have played better? It was an amazing, wonderful performance with every section playing at the top and San Francisco’s Music Director, Michael Tilson Thomas, conducting. The program itself might be matched for brilliance but hardly bettered: Symphony in B minor, the Unfinished, by Franz Schubert, and Das Lied von der Erde by Gustav Mahler. Written nearly a century apart, the two masterpieces made a powerful, emotion wrenching and heart lifting experience. While Schubert’s Symphony in B Minor is called Unfinished, it does not sound like it lacks anything. There are two movements. The first is enlivened by one of the most beautiful tunes every composed. 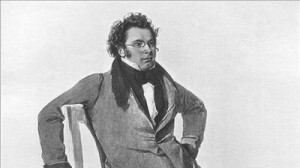 The frequent short hand for why Schubert is so great is that glorious melodies seemed to well up in him faster than anyone could write them, certainly faster than someone who would live only 31 years (Thirty one years! Turn off the television right now. Do something. Go for a walk in a garden. Read. Listen to Schubert). Behind the beautiful tune there is darkness. Schubert breaks the melody; the suspension creates a dramatic halt of breath. Sadness darts behind the melody. There is a sense of mystery in the sadness. Perhaps Schubert stopped with these two movements because he realized he had said what he wanted to say with this music. Perhaps he could not decide where to go next, maybe because these movements are perfect as they are. Gustav Mahler received a gift in 1907, the book The Chinese Flute translated into German. The Chinese poems inspired Mahler to write Das LIed von der Erde, The Song of the Earth. The collection includes the work of several poets of the Eighth Century. There are drinking songs, wistful songs longing for love, songs in which the poet tries to accommodate knowledge of human mortality in his delight in nature, such as in The Drinking Song of the Earth’s Sorrow. These beautiful, perceptive, delicate and yet powerful poems reached across the centuries and continents to Mahler’s heart. It was a troubled heart at this time. An avid athlete, he had learned he had a heart ailment which would strictly limit his activities and surely kill him. He had also just lost a daughter, under 5 years old, to diphtheria and scarlet fever. At this performance, the singers were mezzo-soprano Sasha Cooke and tenor Simon O’Neill. They both performed with power and sensitivity to the poetry. Their performances were a great match to the SF Symphony’s remarkable performance. Mahler’s music engulfed Davies Symphony Hall in love and wonder at life, whole hearted engagement with our earth despite our own limitations. The San Francisco Symphony was scheduled to perform this program at Carnegie Hall, April 14, with the same singers. Surely it was a concert to knock the socks off the New Yorkers. Pictures from top: Franz Schubert, Gustav Mahler, Simon O’Neill, Sasha Cooke. This entry was posted in Hedgehog Highlights and tagged Das Lied von der Erde, Davies Symphony Hall, Franz Schubert, Gustav Mahler, Michael Tilson Thomas, San Francisco Symphony, Sasha Cooke, Schubert Symphony in B minor, Simon O'Neill, The Chinese Flute, the Unfinished Symphony on April 30, 2016 by Leslie.